Pergolas can add shade and comfort while complementing the breezy open spaces of a yard. Gazebos can create a little interiority outside, letting you and your loved ones enjoy the summer warmth without risking sunburn. Check out some of our favorite ideas below! Sometimes, basic is better. This gorgeous, simple pergola adds shade and comfort to an otherwise boring patio. It’s just the right size for a table and chairs, but is flexible enough to be dressed up or down, depending on your mood. Hanging planters or lights can add charm and color, as could curtains, climbing plants, or paint! This gorgeous DIY pergola, shown on My Frugal Adventures, features dreamy all-weather drapery for even more cooling shade. The dark stain on the wood really makes the white drapes pop, and the cafe lights strung around the pergola make this a great transitional space. Perfect for use during the day or into the evening! Need a bit of privacy? A walled gazebo is a great way to hide from the heat while still enjoying the warmth of summer. This little slice of heaven contains a cozy bench, perfect for snuggling up with a book or cool drink. Sage green paint elevates this from simple garden shed to chic getaway. 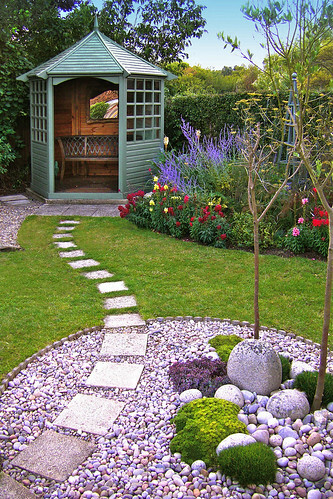 Like the gazebo look, but want to open it up a bit? Add a door or two. By utilizing two lovely french doors and a transom, this garden gazebo creates a secluded space without walling anything off. Check out Woodgrain’s selection of french doors and let your imagination run wild! We want to see how you beat the heat during these dog days of summer. Tag us on Facebook or Instagram to show us your strategies, and check out our Pergolas and Gazebos pinboard for more outdoor inspiration.